In addition to providing quality proxy summaries (see our report for details), the best Proxy Statements of the S&P 500 also presented their nominee information in improved ways for investors. In our 2017 S&P 500 study, the S&P 500 had a 60% adoption rate of using enhanced methods to present nominee information, including photos, skill lists, committee membership highlights, and more. 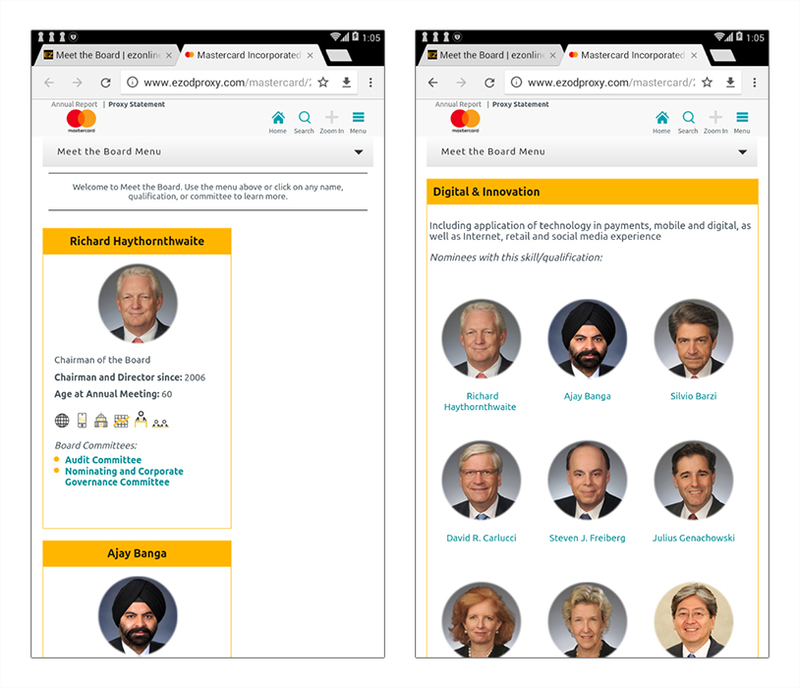 To highlight the state of the art presentation methods, we conducted a focused review on companies in our 2017 S&P 500 study who had an enhanced nominee presentation and also used an HTML/Interactive approach for online delivery. There were thirty-nine companies (8%) in the S&P 500 study who met both of these criteria. Below are highlights of key strategies used by this review group for inspiration when considering upgrades you can make to your nominee presentation in your Proxy Statement. Our review group often presented key summary information in charts and lists. For samples, see our other article about proxy summaries. All of the companies in our review group capitalized on their hard work by making their Proxy Statements work well for digital investors. Upgraded online versions of their Proxy Statements included enhanced navigation to help digital investors consume the document more like a website than a printed document. 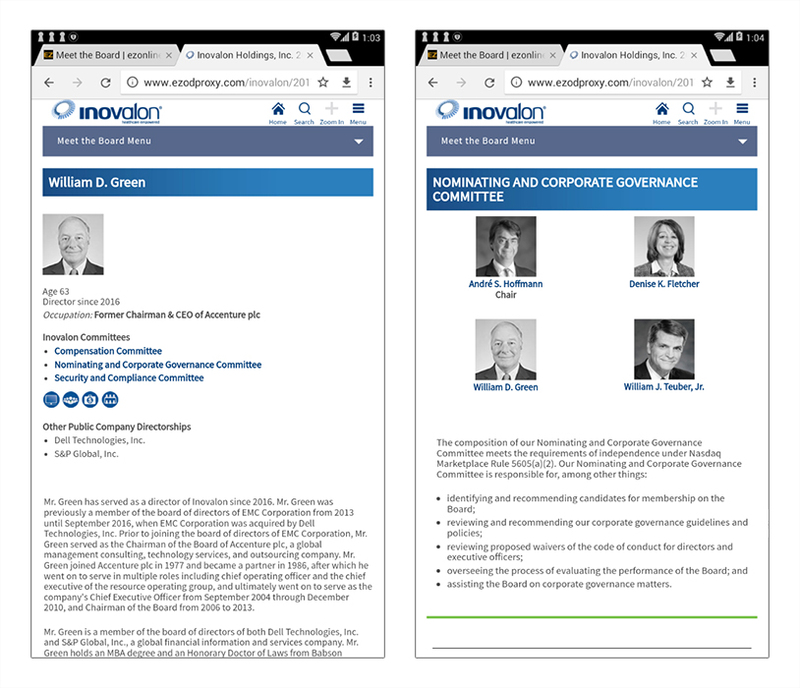 Such navigation features included cross-linking nominees, skills, and committees to peruse the content in an interactive way. Hover effects and other high-quality web functionality components were also often included. Other key strategies to better embrace digital investors included using strong branding elements such as colors and styles that matched the company’s document. In such cases, the effort put forward to create a visually-appealing print document or website was adapted so that the online Proxy nominee information was customized and brand-specific for each particular company. Support for mobile investors is a high hurdle that only a few in the review group have cleared. In addition to the strategies used for all digital investors, support for tablet and mobile investors also requires nominee information to automatically adjust to screen size in order to be readable without having to pinch/zoom or scroll horizontally. Adding a menu element that caters to mobile devices (such as a “hamburger” menu) is an additional strategy that benefits mobile investors, since menus reduce excessive scrolling on smaller devices and allow for faster navigation and location of information. 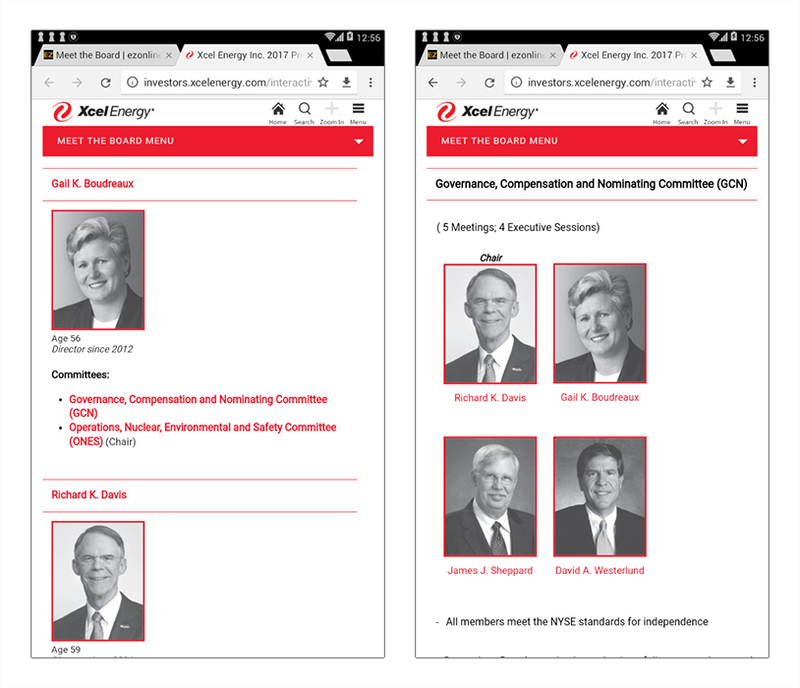 Another important part of mobile-friendly nominee presentation is the inclusion of important SEC requirements and recommendations, such as full-text searching. 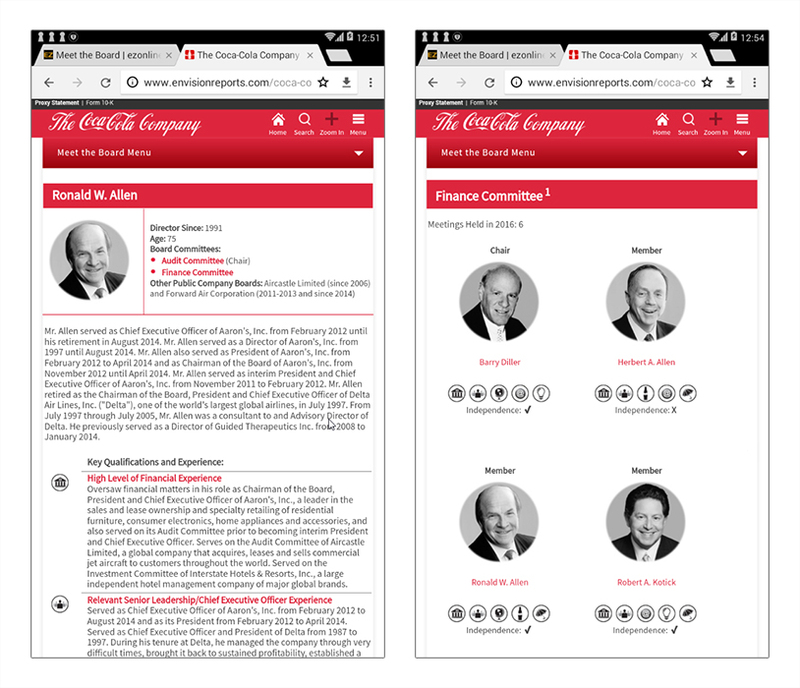 In our review group, only companies who provided a custom HTML conversion or used a product such as EZOnlineDocuments’ Meet the Board to present nominee information were able to provide the highest level of support for tablet and mobile users in regard to nominee content.